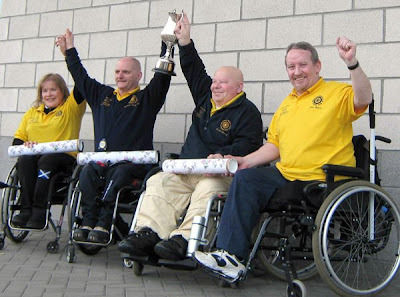 The Scottish Wheelchair Championship was held at Curl Aberdeen at the weekend. The semis matched Gregor Ewan’s Moray team against Mo Simpson’s Highland side, and Michael McCreadie, Braehead, faced Jim Sellar of South Lanarkshire. All the results and linescores can be found here. Ewan and McCreadie progressed to contest the final. Gerald Pocock, Jim Elliot, Aileen Neilson and skip Michael McCreadie stole a single at the fifth to lead 5-3. But the title was decided on the last stone in the eighth end. The Braehead skip had to tap back an Elgin shot to win, and did so. Gregor Ewan, Norman Anderson, Jim Gault and Michael Mackenzie were the runners-up. Above L-R: Aileen Neilson, Michael McCreadie, Gerald Pocock and Jim Elliot with the trophy. Photo by Judy Mackenzie. Thanks to Judy for this and the report.